Tabitha Arlethia Stone: Eliza Greenfield, Opera Singer "the BLACK SWAN"
Eliza Greenfield, Opera Singer "the BLACK SWAN"
Elizabeth Greenfield made her professional singing debut in Buffalo, New York, in 1851, shortly after the highly publicized Jenny Lind tour. Mimicking Jenny Lind's sobriquet, the Swedish Nightingale, a Buffalo reviewer dubbed Greenfield "the Black Swan," a name that remained for many years. 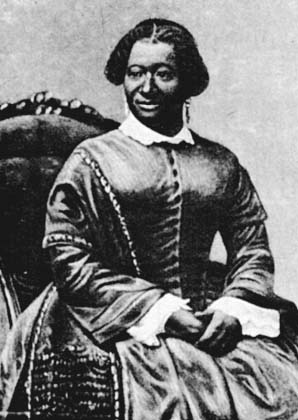 Greenfield was born a slave in Natchez, Mississippi; her owner relocated to Philadelphia, freed Greenfield, and paid for voice lessons for her. As these newspaper reviews reflect, critics attributed Greenfield's sell-out performances in upstate New York and Massachusetts to the novelty of an African-American opera singer and the area's support for abolition as much as to her singing abilities. After her success in upstate New York, Greenfield hired Col. J. H. Wood as her manager. Col. Wood was the former proprietor of Wood's Museum in Cincinnati, Ohio. Among the musical novelties of the day, the public are soon to be astonished by the debut of a young lady of African extraction, by the name of Eliza Greenfield. We had the pleasure last evening in company with a party of Musical Amateurs, of listening to her performance and must confess we were completely surprised and delighted. Miss Greenfield possesses a voice of great purity and flexibility, and of extraordinary compass; singing the notes in alto, with brilliancy and sweetness, and descending to the bass notes with a power and volume perfectly astonishing. She sang among other pieces "When the gloom if night retiring," with a degree of artistic finish that many of our celebrated Prima Donnas might envy. We learn that measures are in progress to give our citizens an opportunity of hearing this new musical wonder, and we can safely vouch there will be no disappointment. The Black Swan Concert, (we are sorry that the worthy Miss Greenfield has been so named, but it cannot now be remedied), occurred last evening, and it certainly was a remarkable event in many respects. On Monday, Parodi in all her splendor sustained by Patti and Strakosh, sang at Townsend Hall to half a house. Last night Miss Greenfield sang at the same place to a crowded house of the respectable, cultivated and fashionable people of the city. Jenny Lind has never drawn a better house as to character, than that which listened with evident satisfaction to this unheralded and almost unknown African Nightingale. Curiosity did something for her but not all. She has merit, very great merit, and with cultivation (instruction) she will rank among the very first vocalists of the age. She has a voice of great sweetness and power, with a wider range from the lower to highest notes than we have ever listened to, flexibility is not wanting, and her control of it is beyond example for a new and untaught vocalist. Her performance was received with marked approbation and applause, from those who know what to applaud. It may be inferred by persons abroad that the success of Miss Greenfield resulted from some abolition or "higher law" fanaticism, but this is not so. She is countenanced and especially patronized by distinguished Silver Greys and comprise men, so that while we congratulate a worthy member of a proscribed race upon her remarkable success, we can assure the public that the Union is in no degree periled by it. May we not hope that her music may tend to soften the hearts of the free and lighten the shackles of her race enslaved. We are informed from a reliable source that Col. J. H. Wood, of Cincinnati, has entered into an arrangement with Miss Greenfield, by which she will give concerts in this country and Europe during the next three years. Col. Wood is an able and experienced manager, and will see to it that the "Swan" is brought before the public in a manner commensurate with her great genius and the high order of her talents. The necessary securities to insure her from loss have been furnished, and there is no doubt that her career will be alike honorable and profitable, both to herself and her business manager.